For the dough: Preheat oven to at 350 °F. In a small pot, create an infusion with the cup of water and aniseed. Let cool, but don’t strain. In a food processor, process the flour, salt and shortening until oatmeal-like in appearance. Add the yolks and aniseed infusion, little by little, until dough is formed. Work with this dough until it no longer sticks to your hands. Transfer the dough to a floured surface and lightly knead, incorporating the toasted sesame. Wrap in plastic wrap and refrigerate for at least 1 hour. Divide the dough into small portions and form long bars. Arrange the bars on a greased baking sheet. Bake for 12-15 minutes or until the dough has dried. Let cool on a cooling rack. If you transfer the bars straight out of the oven, they might break. To prepare the honey: Add water, cloves, orange and apple slices, quince, and pineapple skin and boil over high heat until the fruit has softened. Strain and remove the solids. Put the liquid back on the burner and add the sugar, dark brown sugar and fig leaves until gently boiling. Cool to room temperature. It should be slightly thick in texture. For the garnish: Rearrange a layer of nougat bars in the bottom of a pan or baking sheet, filling in all the open spaces with any of the pieces of broken bars. They should be evenly spaced out. Coat with honey and create another layer of bars, having them go opposite direction of the bottom layer, coating once again with honey. Repeat these steps finishing with a top layer of honey. Garnish with sprinkles. Cut in desired serving sizes. This is a sweet treat enjoyed in smaller portions. Use this nougat as part of the crust for a Doña Pepa Turron cheesecake. It’s delicious. October is a month loaded with tradition in Peru. It’s the month of the Señor de los Milagros, which has a number of devoted followers. According to a legend, a woman by the name of Josefa Marmanillo became ill and couldn’t walk or work. Overwhelmed but hopeful, she asked for a miracle, promising she would prepare a sweet dish in the name of this lord. One night she was healed and in her dreams, received this nougat recipe which she later prepared and sold on the streets. That’s how this recipe got its name. 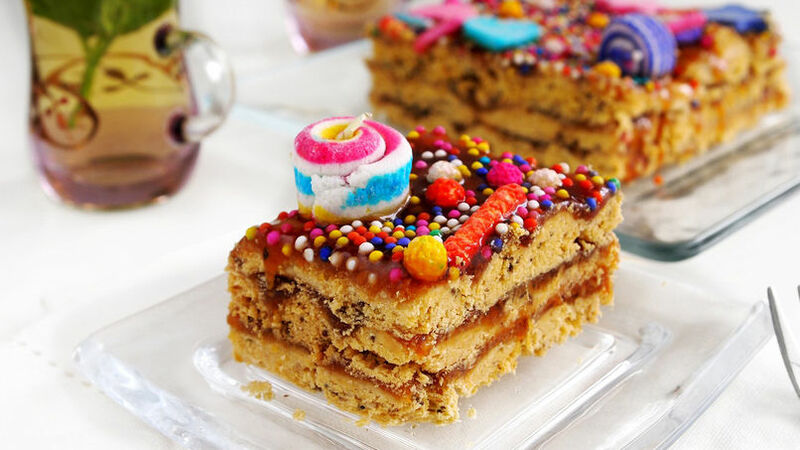 This Turrón de Doña Pepa was only available in the month of October. However, there are now a number of bakeries and stores that sell it, along with turroneros, by the kilo, year round. The preparation process is quite long and there are a number or variations of this recipe. Some nougat treats are softer than others, some dissolve in your mouth, while others are much drier. Ideally, this recipe should be soft, yet easy to cut into individual servings.